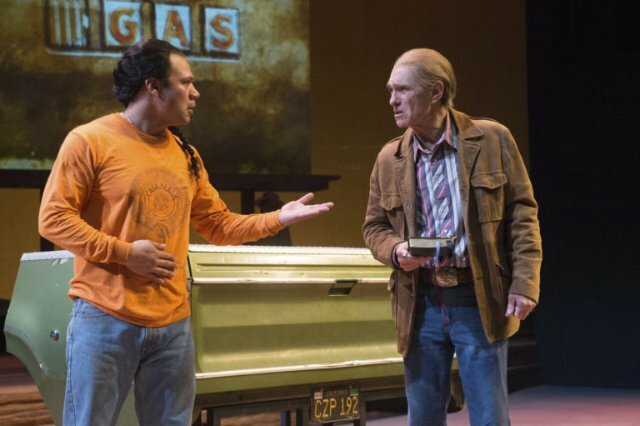 Tony Sancho as Martín Jodes, Mark Murphey as William Joad. Photo by Jenny Graham. In John Steinbeck’s magnificent novel The Grapes of Wrath, and the great film of the same name, the Joad family left the Dust Bowl of Oklahoma, where dust clouds devastated crops, livelihoods, and the health of humans and animals alike. Over 2 million took the odyssey to the fabled land of California. Some migrants, including Grandpa Joad, died on the way, while others lacked the wherewithal to make it. Those part-trippers took on menial tasks anywhere they could find sustenance along Route 66, turning villages into towns. Tom Joad and the rest of his family made it, but soon found that the land of milk and honey offers travails of different kinds. The modus operandi of most sequels, especially in movies, is formulaic. Give the audience more of the same, with the same lead characters and themes. Octavio Solis twists that hackneyed premise in his world premiere drama Mother Road, borrowing Steinbeck’s framework as a backdrop and featuring Tom’s relations four score years later. This saga shares some social concerns of its predecessor but adds new, updated layers in this powerful narrative. During the Depression, Tom’s cousin, William Joad, then a child, and his mother were abandoned by his father to fend for themselves during the Dust Bowl. Eventually, William would acquire 2,000 acres and become a prominent farmer in the former Choctaw Nation region of eastern Oklahoma. Childless, William seeks blood family to help secure his legacy. His lawyer susses out Martín (mar-TEEN) Jodes (HO-dess), the great-grandson of Tom, with a most unlikely story of descendency, suggested by the adaptation of his surname. But the real story is delivered by way of a road trip as William, Martin, and some friends and strangers picked up along the way embark on a reverse migration along the mother road. Solis expresses moral outrage for prejudice against and failed justice for minorities. Though Mother Road touches on gender, gay, and ethnic discrimination, and even reverse discrimination, his passion is for Latinos, especially Chicanos, and his subject is Martín. But in his treatment of the legacy from William to Martín, he also observes the transition of American society in which the white population is losing its majority to people of color. Both male relations are drawn as full-blooded figures. In many ways, William is a crotchety old man set in his ways. But his beliefs and practices are not as antediluvian as his speech and mannerisms might at first suggest. Martín is a young man who wishes to do right, but as indicated in one of his rants, he resents the many abuses that he as a Mexican suffers just because of his skin. Indeed, in one instance, passersby interrupt an altercation between William and Martín, and as would be expected in our society, they take William’s side, even though he was in the wrong. But Martín suffers a trait that brings trouble his way. He lets pride get in the way of expediency, even when a problem can reasonably be solved and there is nothing to be lost by going along to get along. The playwright’s overarching plotline engages with contemporary themes, plumbing the depth and complexity of situations in which ingrained assumptions of the majority population disadvantage the already disadvantaged. Recognizing one of today’s most tragic trends, unhappy interactions with police are included. The tone of Mother Road successfully drifts between realism and dream state, between drama and comedy. Overall, the approach works, but Solis perhaps tries to accomplish too much. Instead of limiting the ethnic hardships to the plight of Latinos, mini events concerning African-Americans and Choctaws are introduced. The use of a Greek chorus bears mixed results, and two instances of anthropomorphising mechanical devices are amusing but don’t seem relevant. Also, too many unlikely coincidences drive the action. In the most egregious example, markings in a bible from 80 years ago are interpreted as map directions, which lead the travelers to an important denouement. The narrative simply stands on its own, and the gadgets aren’t necessary. The production works well with the material. Sparse Southwestern staging with highway markings across the breadth of the set are complemented by full back wall projections. Mark Murphey excels as the withered, declining William with the look and sound of a dust and wind beaten Okie. At once, his character appears typically rural Southwestern, but he surprises with his receptivity to the out of the ordinary. His counterpoint, Tony Sancho, embodies the young Mexican-American – proud, but stuck in the rut of low opportunity and low expectation. Mother Road by Octavio Solis is produced by Oregon Shakespeare Festival and plays in repertory at its August Bowmer Theatre in Ashland, Oregon through October 26, 2019.